Our Digital Menu Boards attract and retain your customer’s attention. High definition digital menu boards provide colourful, rich, vibrant videos and pictures that are more appealing than traditional printed menus. 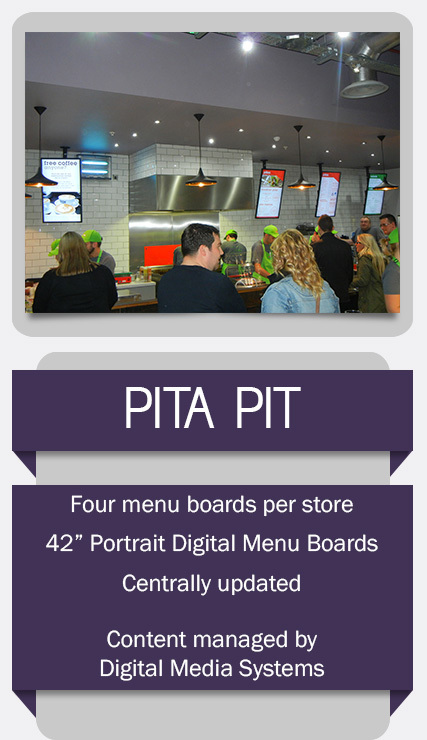 Enhance your existing restaurant with Digital Menu Boards and your bottom line will show it. Your customers will love these colourful, dynamic menus. Customers and Employee both respond positively to the messages presented on your monitors. Improve communications with your customers, reinforce the brand, up sell or cross sell products which leads to an increase your average sale. 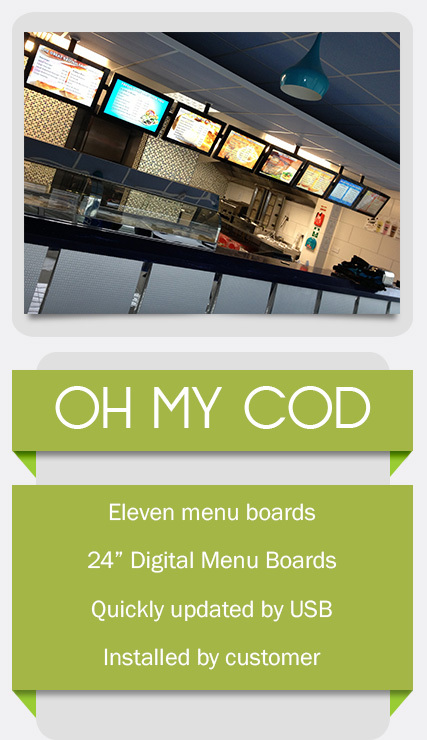 Digital Menu Boards require less space and are easily updated by you or by instructing our in house design team. Our dedicated design team make sure your new Digital Menus are appetising with the perfect mix of eye catching pictures, words and animation. Making sure that you have the correct Digital Content can help increase your average sales. 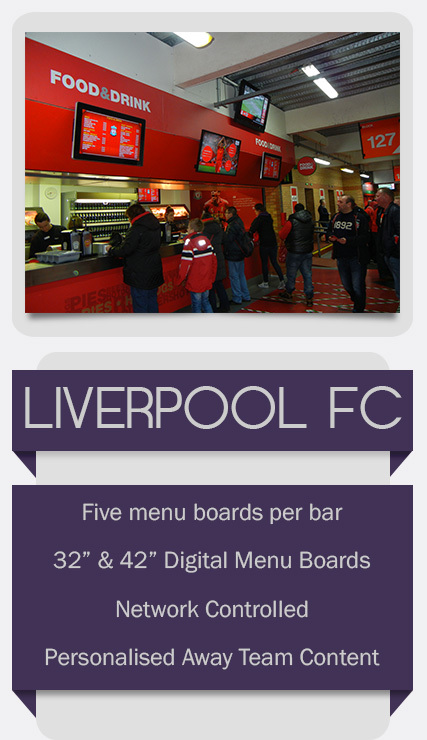 How many and what size Digital Menu Boards will you need? Where will the monitors be located (wall mount or ceiling mount)? Will the content of the monitors need to be updated frequently or occasionally? Content Priority – What menu item should be more important? Branding – How will you match the “theme” of your store and menu boards? Digital Menu Board projects are complicated. They are not a collection of TV screens with a USB port or computer attached them and then mounted to a wall or ceiling. 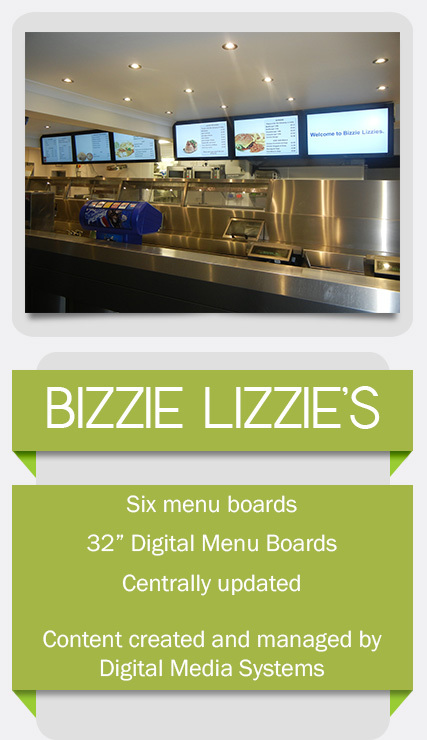 Our USB Digital Menu Boards are designed from the ground up to provide a long term solution. They are built from commercial grade components with 24/7 use in mind and are available in sizes ranging from 19” up to 80” and can be used in landscape or portrait. Whatever the size you decide on you can be assured it will display Full HD content made up of pictures, videos and even scrolling ticker text on the bottom. Looking from the outside each unit has edge to edge toughened glass with no plastic bezel where grease or dust can get trapped. The glass can be quickly and easily cleaned with a damp cloth. There are no buttons or lights on the front or the sides to be fiddled with. Every Digital Menu Board comes with a secure, flat, mounting plate as standard. Internally, this is where our products pay back in reliability. They have an intelligent fan based cooling system which adjusts the fans speed as required. Keeping the product cool ensures your product will be working for many years to come. 7 day on/off timers ensure the Digital Menu Boards switch on and off automatically throughout the day. Updating the Menu Board is a simple process of plugging a USB memory stick into the hidden socket. When your new menu content is copied to the screen remove the USB and that’s it. The Digital Menu Screen will start displaying your new menu. Each Standalone Digital Menu Board can display different menus at different times of the day. This is also known as day-parting and allows you to seamlessly display breakfast, lunch, dinner menus automatically. You’ll never need to press a button or turn an old fashioned menu board over again! Our USB Standalone Digital Menus are an affordable way to get going. However, if in the future, you decided you wanted to centrally control them or update them over the internet, then they are ready to be upgraded with that capability. Our squareVIEW Digital Menu Boards are commercial Digital Menu Boards that can be updated and managed from a central location, this could be from your home, office or we could even do this for you. You have the power to quickly change prices and products on screen no matter where you are. Using squareVIEW DMB software you can show your colourful menu alongside TV, Weather, News, Scrolling RSS, Twitter feeds, Facebook likes and much more. Centrally managed displays are ideal where you have multiple restaurants, takeaways or sites in different parts of the town, county or country. Each screen can be targeted with whatever promotion or menu you wish and this can be scheduled well in advance of when it goes live. Our networked displays can also link with your EPOS system to ensure that the price and products between the two items are always the same. 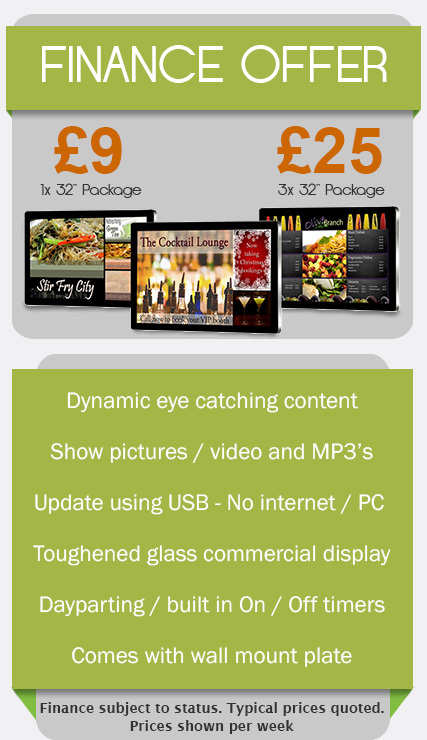 No longer will the Menu Board show a different price than the EPOS! We understand the move traditional to digital menus can be a minefield. There are lots of questions and even more answers depending on who you talk to. Our years of experience of working with customers like you means you will always get the right solution for both your needs today and in the future. Ongoing Content Management – Maintain and update your graphic content. See Menu Board Content Creation. Ongoing training, support and upgrades. We understand that installation of the monitors along is not the total cost of ownership. Every digital signage project has its own challenges. Challenges like the physical environment, technology, content management, timing and budget. When you work with us you work with passionate people who are experienced at what they do. All your Digital Displays are tested before they are despatched to you. We make sure your hardware and digital content are working perfectly together. Our installation team then make sure that the physical installation on site is carried out in a tidy and safe manner leaving you with a solution to be proud of. We love a long term relationship and would like to be your “Digital Menu Content provider” for years to come.